John Haslett started out as another raft wacko. But somewhere between the construction of his first raft, Illa-Tiki, in Ecuador in 1995, and the wreck of his fourth, Endurancia, in Costa Rica in 1999, he grew into something else, as neatly described in the subtitle of his book Voyage of the Manteño: The Education of a Modern-Day Expeditioner. (The book was recently republished in Kindle format under a new title: The Lost Raft: The True Story of Madness, Mutiny, Mud, Sharks, Shipwrecks, Survival, and Extraordinary Discovery in the Wake of Kon-Tiki.) Not to say that he entirely lost the wacko attitude. But as his expeditions morphed from mere adventures into serious research efforts, Haslett's youthful dilettantism dissolved, replaced by maturity and competence as a logistician, mariner, and leader. All of Haslett's voyages were on balsa log rafts, begun on the west coast of Central and South America. Illa-Tiki set out from Ecuador bound for Hawaii, with no real objective other than to do something Thor Heyerdahl-ish. By the time that voyage had failed, Haslett had redefined the goal of his rafting efforts, so that his second voyage, aboard the raft Manteño, was no longer just a voyage but, rather, an expedition -- a voyage with a purpose -- seeking to demonstrate that Precolumbian trade, which is believed to have occurred between Ecuador and Mexico, could have been conducted by the Manteño people of Ecuador using balsa sailing rafts of the kind reported by early European explorers, which reports are not universally accepted as accurate or credible. Not one of Haslett's four raft voyages came close to reaching its destination, and the last one wrecked almost as soon as it began. 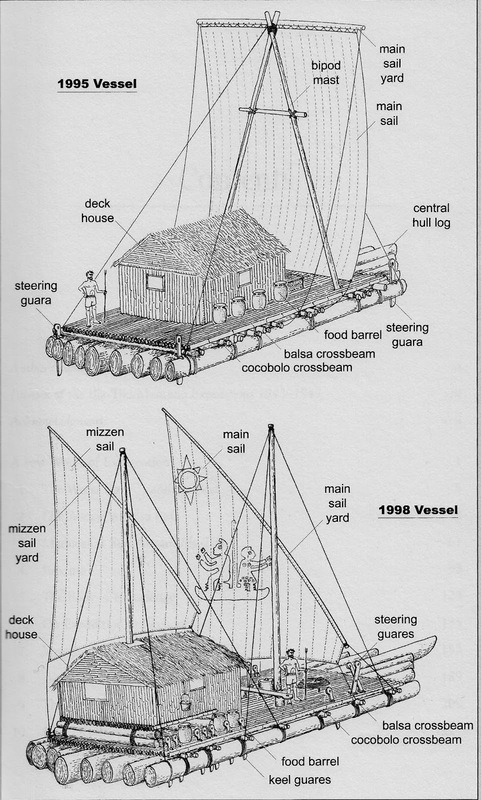 But even in their failures, Haslett's voyages contributed something to our understanding of the rafts that the Manteño people might have used. Some of the most important of those contributions are in the negative: Haslet''s experience shows us just as much of what the rafts were not or could not do as it shows us what they might have been and might have been capable of. That's the kind of research, the kind of science, that we hear too little of, but it's every bit as important to our understanding of reality as the so-called successes. Haslett's book is a detailed record of gruelling hard work rewarded by the "failure" of the voyages to reach their destinations. As I read Voyage of the Manteño, I looked forward to summarizing it here, for it is by far the most fascinating and best-written rafting adventure I've come across. But I've found that this has already been done competently by others, including a nice summary of the first three voyages, and details about the construction and sailing characteristics of the rafts described in academic but very readable form by Cameron Smith, an archaeologist who accompanied Haslett on some of the voyages. There's no need to repeat these available sources, and I leave interested readers to read them for specifics on Haslett's voyages and vessels. But I also urge them to read Haslett's book for a gripping, suitably humble, and altogether satisfying first-hand account of how, through hardship, hard work and the force of necessity, naivete can grow to maturity and seriousness of purpose.